30A Seacrest Beach FL House with Private Pool + FREE BEACH TRAM SERVICE! Updated Beach House with Private Pool - Gorgeous Decor - Lots of Room - Great Reunion House - Private Pool & Huge Community Pool - Free Shuttle Service to Beach! Fall and winter are the perfect times to visit Seacrest. The crowds are gone, you can sit outside without melting, and the beach is perfect. Enjoy Casa Blanca where everything is a little less stressful! This property boasts 4100 sq ft.
You will be impressed with 'Casa Blanca' the instant you see it. Once you step inside, you will be thrilled with the light and airy great room with its wall-to-wall windows, bamboo hardwood flooring, and open layout leading to the adjoining dining and kitchen areas. Lots of room to relax in the living area. Plus, ample space for dining at the table and central bar area adjoining the spacious kitchen with upscale appliances, granite countertops, and unique zebra wood cabinets. The ground floor also includes a Den/Bedroom (Twin beds) with wet bar, adjoining bath, and access to the screened porch overlooking the private, splash pool (10X12). Upstairs, you will find three bedroom suites- the master with a King, a guest room with a Queen, and the third bedroom with two Queen beds - each with a private adjoining bath and access to a private porch. A third floor tower room with wet bar and mini-fridge opens onto a sun deck and wrap-porch that's perfect for soaking up the sun in private. Relax as you look out over the Gulf while viewing our spectacular sunsets. 'Casa Blanca' includes a Home Theatre System with large plasma TV in the great room, plus flat screen TVs with DVD players throughout. The stereo system can be enjoyed inside and out with speakers on the screened porch. Wireless Hi-Speed Internet and free telephone calls inside the US. The carriage house can be rented for an additional base fee of $500. Please call or email with any questions or concerns about adding the carriage house to your reservation. The first floor small bedroom has a daybed with pull out trundle and a full bathroom with shower. The 2nd floor of the carriage house has a Queen bed and full bathroom. A huge 12,000 sq. ft. community pool is nearby for your enjoyment, but you also have your own private pool for the kids to enjoy when it is time to stay at the house for awhile - great for a late night dip, too. Take a short stroll to the beach, or have the community beach shuttle pick you up at your door - free of charge. 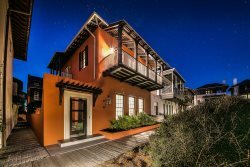 Take a short stroll or ride your bike along the paved biking paths to the shops and restaurants at the adjacent communities of the Village of South Walton and Rosemary Beach. Only 15 minutes to Pier Park, a new complex of shops, restaurants, activities, and a multi-screen theater. You will leave with unforgettable memories and hopefully will plan another visit to 'Casa Blanca', so you can 'Play it again, Sam'! This house fit the needs of family very well.